Right now we are waiting for new Mary FEDDEN Figures Art to arrive at the gallery. In the meantime, here is a wider selection of the artist's work featured at the Red Rag British Gallery. Mary Fedden was born in Bristol in 1915. She studied at the Slade School of Fine Arts, London from 1932 to 1936. After leaving the college Mary Fedden made a living teaching, painting portraits and producing stage designs for Sadlers Wells and the Arts Theatre. The outbreak of the Second World War saw Fedden serving in the Land Army and the Woman's Voluntary Service and she was commissioned to produce murals to help the war effort. 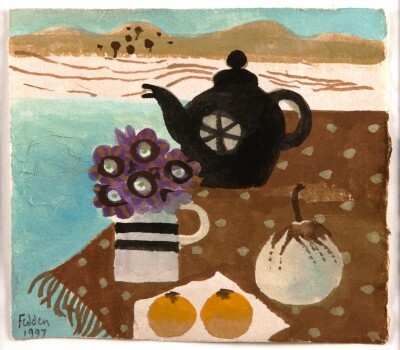 After the war, Fedden returned to painting and started to develop her individual style of still life painting reminiscent of artists such as Matisse and Braque. Several artists were to influence Mary Fedden's work. In an article in 'The Artist' magazine, she wrote: 'I really float from influence to influence. I found the early Ben Nicholson's fascinating as were the paintings of his wife Winifred. I also admire the Scottish artist Anne Redpath and the French painter Henri Hayden. Another major influence was her artist husband Julian Trevelyan, an English surrealist artist and printmaker, who she married in 1951. Under Trevelyan's tuition, Fedden's work began to show the influences of Braque and Matisse in its organisation of flat picture planes and separate still-life objects; the shapes of fruit and flowers and vases, a pot of mustard and a jar of marmalade set up a Matissean rhythm against a scarlet or orange field that may or may not be a tablecloth or a wall. Trevelyan and Fedden took a studio by the River Thames at Chiswick, where she lived and worked until she passed away. Together, Trevelyan and Fedden travelled widely and even collaborated on a mural commission for Charing Cross Hospital. Fedden received several other art commissions for murals, most importantly from the Festival of Britain (1951), the P & O Liner, Canberra (1961) as well as from schools and hospitals. From 1958-1964 Mary Fedden taught at the Royal College of Art and was appointed the first female tutor in the Painting School. Her pupils included artists David Hockney and Allen Jones. Subsequently, Mary taught at the Yehudi Menuhin School. She served as president of the Royal West of England Academy (RWA) during 1984-1988. In 1996 the University of Bath awarded Fedden an honorary doctorate in recognition of her contribution to British art. In 1997 she was given an OBE. Fedden has been the subject of two biographies. 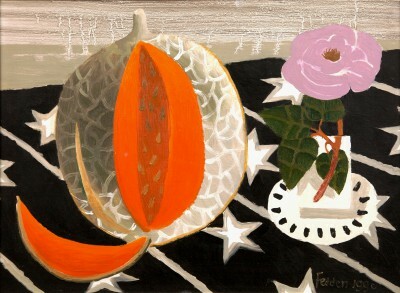 In Mary Fedden (1995), Mel Gooding commented: "Fedden's painting reflects her personality in its capacious love for the objects of its attention". In Mary Fedden: Enigma and Variations (2007), Christopher Andreae remarked: "She paints with unstinting disregard for the tastes and opinions of others and paints fast and often. She paints 'through the bad times' and paints on because continuing to paint is what she chooses and loves to do, and it is what drives her. Stopping is just not part of the plan." Mary Fedden remained a prolific painter until her death in 2012. During her career she attracted glowing praise and stinging criticism in roughly equal measure. Her paintings considered essentially decorative in the sense that Matisses was, and in the context of Modern British art it follows in a direct line from the works of Christopher Wood as well as early Ben and Winifred Nicholson. Fedden's concentration on decorative art led to most criticism, but as is the norm an artist often has to wait until after their death for a more considered appraisal. Today, Fedden is viewed as a highly important figure to British 20th-century art history. She is one of Britains best loved and most collectible artists. Her paintings can be found in many private art collections including HM The Queen for Windsor Castle, Prince Hassan of Jordan, the Tate Gallery, Bristol City Art Gallery and The Royal Academy. Fedden was a British artist whose finely executed paintings often took the form of a hybrid between a still life and a landscape.She would typically position a group of objects such as fruit, bottles and cats depicted in fine detail in front of a striking background scene. She is best known for her bold, vivid still lifes and her colourful views of Italy and North Africa.